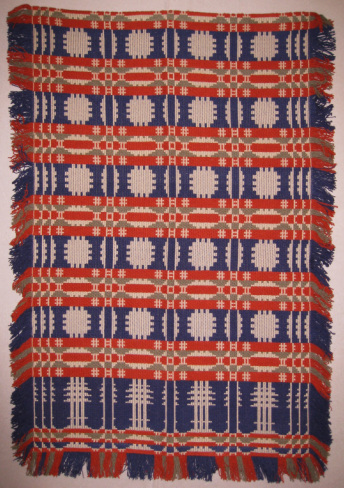 Gay McGeary’s handwoven coverlets are inspired by the works of early Pennsylvania Germans. By studying early coverlets and pattern manuscripts from the nineteenth century, she has learned about the design elements used by the early master weavers to create this early art form. She incorporates color, texture and pattern within her finely woven coverlets; combining art with function. Gay sees each coverlet as a work of art, a living statement from the past, an embodiment of color, design and texture, inviting one into the mind of the artisan who created it. Often more than one mind is at work, as a pattern is repeated with individual variations, like a piece of music played over by different musicians, frozen to the eye forever more, each thread a note in the composition. The delight of the modern scholar-weaver lies in the understanding of technique, the mathematical precision of it, the mastery of materials required for the final work.